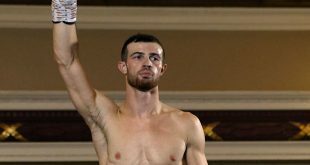 At the Victoria Warehouse, Manchester, on Saturday night, Marc Leach of Salford won an English Bantamweight Title Eliminator by stopping Louis Norman in round 2. 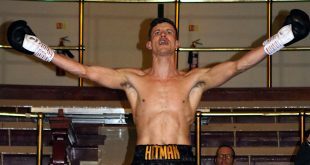 Norman was on the canvas three times before Referee John Latham waved the fight off – with the Shepshed man looking dazed as he stood for the count. Livewire Leach improves to 11 wins with 1 loss. 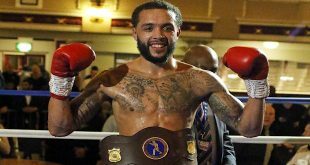 The Steve Wood – VIP Boxing Promotions show featured ten fights in total, but the fight of the night was a close one between Danny Wright and Zoltan Szabo. A fast-paced, all action six round Super-Lightweight contest which saw Wright get the win on points 60-55. Fleming wins on points 40-37 with Connelly having a good round four. Gardner wins by TKO Round 3 Referee John Latham stopped the fight as Ducie was taking too many punches. Ducie protested. Arthur wins by TKO in 2min 17 of round 1. An uppercut sends Williams to the canvas and he stood for the count but Referee Sarginson waved the fight off. Williams’s corner were holding the towel at the ready. Williams sustained a nick under the right eye. A close contest. Mitchell tired quickly and Moussinga got more success in the latter half of the fight. 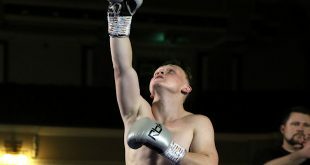 The diabetic man had his levels checked between rounds and became the first UK type 1 Diabetic boxer to win a pro fight.